The sparkling community pool is just two doors away. The community pier is a short walk from the home. Freshly painted outside! More pictures coming soon! Wonderful home with views of the Sound and Gulf at 14 Ensenada Marbella! This home is located in the gated community of Santa Rosa Estates. 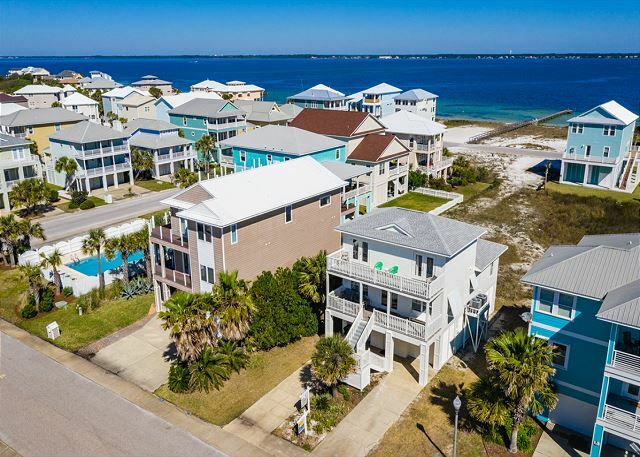 Located in a small private gated community on the pristine east end of the Gulf Islands National Seashore with the Gulf and beach just steps away. Just one door down you'll find the community's gated pool, perfect for a refreshing swim after a long, sun-soaked day on the beach. Beautifully furnished throughout, complemented by hardwood floors in the living areas. Panoramic view from the large second and third floor decks. On the top floor is the spacious master bedroom, complete with a king bed. The second top floor bedroom has queen bed. On the lower level you will find a bedroom with four twin beds (two bunks). There is also a bedroom with an additional queen bed. Perfect for one or two families (sleeps 12). Your pet is welcome to join you, too! This home is located directly across from the beach. Great location. The pool is just 2 doors away. The house is a nice size and would be good for large families. We were a bit disappointed in the condition of the house but were told that things like the carpet are scheduled to be replaced. We didn't have any issues with items not working. The master bed was comfortable. I did suggest to the manager that the house needs more spoons. There were only 5 spoons for a house that sleeps way more than 5. Also there were no containers for left over food. The office was very helpful and immediately helped us when the gate code was changed mid stay. I would recommend this property when the improvements have been made. We had a fabulous time at Ensendada Marbella! It was close to the beach and fishing pier on the bay. The community pool was great on the days when the ocean was too rough. The kitchen was well equipped and living room was perfect for our families. The porch was a wonderful place to hang out on the evenings. There were a few wear and tear issues that might need attending to such as the missing knob on the upstairs patio door and missing paint on the front door. The queen bed upstairs also needs replacing as it sunk in the middle pretty bad. Overall, though, the house was convenient, clean, and perfect for our families! Thank you for posting your review. We will certainly look into repairing/replacing items mentioned. We're so glad you enjoyed your stay with us and we look forward to your return! Thank you for taking time to post your review. We're so glad that you enjoyed your stay and we look forward to your return! Overall the house was a great rental and I would rent again. The location was perfect, with the beach just a very short walk across, even with small kids, and the sound with a fishing pier behind the property. It was also away from the crowded area, so crossing the street to get to the beach was easy. The house was bigger than the pictures depict, and was clean upon arrival. The management staff was a pleasure to work with. The only complaints were the dingy carpet and that there was not a cover over the porches. It rained a good bit during our stay, and we couldn't sit outside. Also, the upstairs full bed was terrible to sleep on. Despite those few complaints and the rain, it was a great stay and would rent this house again! Enjoyed our stay! Chris did a couple of repairs while we were there. Good person! When wife turned in keys she gave a list of needed repairs to the lady. The biggest concern was the bottom and top latch of the left door and the bottom of railing on entrance level porch. See list for other needed repairs. Excellent. the house was great, the staff was wonderful. The location was perfect. Away from the traffic and noise. Quiet little gated community with a dock at the bay and short walk to beach. Views of both waters. Very comfortable beds and AC works great. Nothing to complain about. Nice lodging. Small quiet community pool. Great for family. No loud parties. Great dock for fishing, but a little small. Convenient trolley service into town in the evenings. Property was as described. Location was perfect, just a short walk to the beach & sound. The property is located in a good location. Being in a gated community was good but no security where there is a security guard. You can easily enter the gate without an issue. The walk across the road to the gulf side of the beach was a short walk. The cleaning service was great. The home on the interior needed to be updated and some maintenance work needed to be repaired such as the leaking faucet on the right side in the master bathroom, the kitchen faucet has a leak, and the dryer needs to be repaired for the squeaks very loud, the master bedroom door slams loudly when you are not evenly closing it, swimming pool is not in the best shape, furnitures and TVs needed an upgrade to LCD and be at least a 32". There are barely any pots and pans to cook for a large family of 6 or more even though it rooms 12 people. There is only 1 large pot and 2 very, very small pot. The price for the property is decent but I don't feel comfortable recommending it to anyone. So overall my rating on the property on appearance, interior, location, accessibility, and cleanliness would be a 2.5 stars. Loved it! Located away from the hustle and bustle of Pensacola Beach. House was very nice, with big living, kitchen and dining areas. Great view of gulf and sounsound, both a short walk. Community Pool was just around the corner, which the kids lived. Only criticism was that the sofas in living area were not very comfortable. This is our third time back in this house, our sixth time back to Pensacola Beach. We've always been very pleased with our stay in this house. It perfectly suits our family of 9. 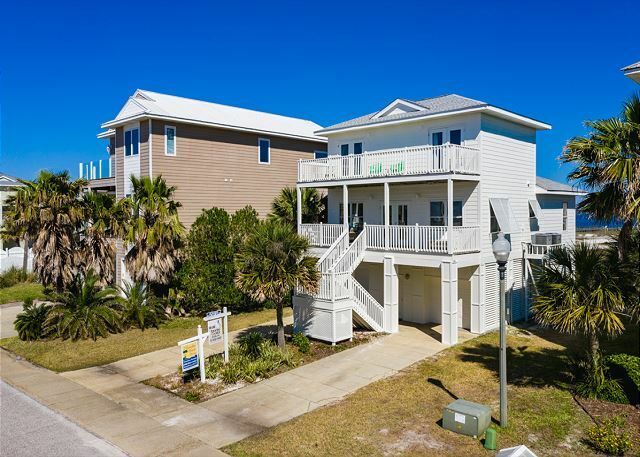 The location is ideal--just steps to the gulf, or if the waves are too high for our littles the sound is just steps away, and then there's always the nice pool as well! We like that it's a gated community on a quiet cul-de-sac so our kids can ride their scooters. The beach is the prettiest I've ever been to, and I've been to several. We always see lots of marine life in the clear waters as well as many great shells. Our older son enjoys all the fish he catches in both the gulf and the sound. Although the house isn't spotless per se(dust, crumbs, older carpet in bedrooms) it's the cleanest place we've been to on the island. We like that we can bring our dog to this house, and also that the house doesn't look or smell like animals have been there. The manager has always been so kind and helpful. The kids call it "our pink house" (although it's kind of peachy-pink), and already we're looking forward to coming back to it next year! Far exceeded our expectations! Location was perfect. Easy access to sound and beach. Pool very close. The sounds from the ocean and the wetland behind us were heavenly in the evenings. Beautiful view of sound from the downstairs bedrooms and incredible view of gulf from upstairs bedrooms and deck. The tile and laminate floors made it nice with kids and dogs. To be honest the house could use a good weekend of handy man help and a few minor upgrades. We really enjoyed our stay and would definitely stay here again! Even though some furnishings and bedroom carpet was dated the house was very , very clean . Beds were very comfortable and plenty of seating for dining. The location is good. The property management company is excellent. Condition of house good. Furniture, poor. Internet, poor. Neighborhood, good. Price, good. Overall experience, good. We were very pleased with the house and its convenience to the beach and hope to return sometime. (The washing machine walked one time when on the spin cycle.) Peg Leg Pete's was a fun restaurant--good food and generous portions. Overall, this house was great. Beautiful views, great location and a private neighborhood. It was only a short walk to the beach which was right across the street from the house. The family also loved the pool next door and all the fishing we did at the dock behind the house. It exceeded our expectations and planning to be back soon. We love the location of this home and what the area has to offer: Gulf, Sound and Pool. Perfect for our family and week of fun. The home is good size and all the people we have come across in the area really nice. 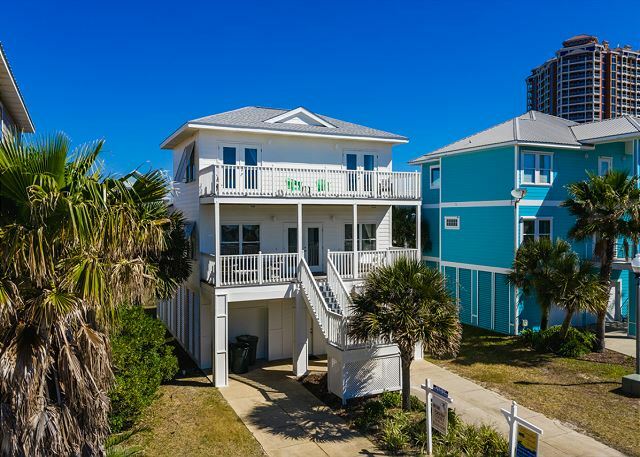 This home offered a beautiful vacation spot from which to enjoy the best of Pensacola Beach. The house was clean and well equipped with what we needed. It was really the perfect size for two families to share and enjoy a week at the beach! The location was terrific - a small, quiet gated community further away from the more touristy area as well as the shops and restaurants, but still within a few minutes drive. The community pool wasn't working while we were there, but they were fixing it so I imagine it's back in working order. The property is also right next to Portofino. So, you have easy access to rent kayaks, paddle boards, water park, and other fun things to do in the Sound within walking distance. The property management company was also excellent and very accommodating, especially with not having access to a pool during our stay. The location was perfect, having the sound, a pool and the gulf within steps from the house. The house was well kept, very clean and roomy. The view from the balconies were great. The neighborhood is quiet. The free beach trolley was icing on the cake as we didn't have to worry about driving after enjoying our nights out in Pensacola Beach, great restaurants, bars and live music. Paradise Beach Homes had everything ready and were a pleasure to do business with. Can't wait to return. We would have preferred the house be closer to the boardwalk area (not having been there before we didn't realize how far away it was). The house was nice, needed a more thorough cleaning - doors were black on edges from hands, kitchen cabinets doors and drawers felt greasy and sticky, ceiling fans in the great room were very dirty; living room furniture was not comfortable. That said, the place met our needs very well and overall was as clean as most places we've stayed. Rental property is always cleaned too quickly for a really job to be done. We enjoyed our stay and would recommend the house. Home was clean and basically in good working order. Location was great and as expected. Only complaint is the dishwasher was broken upon arrival and was not fixed until 4 days after we were there (for a 7 days stay, not good). I asked Paradise Beach Homes for compensation back as the group was very unhappy washing dishes by hand the first 4 days on vacation, but I was ignored. Also, 2 requests to bring batteries for the remote controls and to fix the upstairs door handle leading to the deck from the guest bedroom were ignored. Not good service at all and very disappointed in Paradise Beach Homes for this. Overall we were pleased with our experience. The management staff was friendly and responded quickly to any concerns happily. We loved being so close to the gulf and sound so we could utilize both for our young family. We loved how big the house is. Plenty of room to spread out. The 1st floor porch was nice. The beds were comfortable. Our only complaints were that the windows and blinds didn't work well, the light above the master tub was hanging down from the ceiling, a bedroom door knob broke and we couldn't access the room until I took the knob off, outlets didn't work in 2 bedrooms, the upstairs balcony was rickety and the carpets were heavily stained. With that said, the staff handled everything very well and this is still the best place we've stayed at on the island. This was our 3 different place in 4 years. Good,older with worn spots on carpet. Paint pealing and porch needed pressure washed. Living room furniture worn and chairs shaky. Would rent again. Good location and price was fair. For the most part it was a great rental. A few improvements what need to be done for me to stay again though. The matress in on of the bedrooms was horrible and needs to be replaced. The futons in the living room are not fit to sleep on because they don't lay flat. The futons were also full of sand from previous renters and we're not at cleaned. The location is great. Really enjoyed the quietness of the gated community. We love the Pensacola Beach area and will definitely return again. Once again the staff at Paradise Rentals were fantastic, easy to work with and so very welcoming. The house was exactly what we needed. While it does has some wear and tear on it, it is the perfect location for us. We will rent again! The home was in a great location. We loved the porches and spent a lot of time outside. Loved the pool close by and the quietness of the community. The house was adequate but in need of repairs. I really loved the area but will probably not stay in this particular house. Paradise Beach Homes were so helpful. I had to call regarding several needs and a faulty stove. The sent someone ASAP and were always very nice and professional on the phone. We will definitely use them when we book a home next summer. The only complaint is they listed the house as a 4 bedroom 3 bath. It only has 2 baths and we really needed a third bathroom.